Several people have asked for the recipe for my apple variation of the no-butter pumpkin oatmeal cookies I mentioned in a previous post. These recipes are very flexible… I have made these cookies with applesauce and fresh apples and applesauce and a combination of fresh and dehydrated apples… and both are delicious! Stir in apples, raisins and nuts. Drop rounded tablespoons of cookie dough on parchment or a greased cookie sheet, or use a small scoop. Flatten the dough slightly. Bake at 350°F for approximately fifteen minutes. Test for doneness. Note: Dehydrated apples are a wonderful addition to these cookies (a few quick pulses in the food processor changes dehydrated slices into smaller than raisin-sized bits). 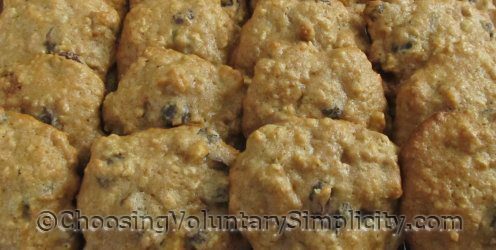 Don’t leave out the raisins and nuts… the variety of textures and flavors is what makes these no-butter oatmeal cookies so appealing! Do You Still Want To Shake Hands? I made these cookies following the recipe exactly. They were so good that the next day I made some more for a church group. I had used up all of my dried apples so I used craisins instead and those cookies were good too but I think not as good as with the dried apples. I have made all of your recipes and love them all. Thanks so much for your clear instructions and wonderful blog. Awesome cookies! Best ones I have ever made without butter. I’m new here but will go now to look up the other oatmeal cookies recipes. Thanks much!! I’m a regular reader and enjoy your diversity of subjects. My wife and I have downshifted as we retire and I have found your viewpoint to be most refreshing and helpful. 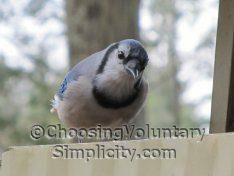 We did not know we could live simply but so well or that frugality doesn’t mean deprivation or being cheap. Simplicity as a lifestyle makes so much sense. Why waste money on things that aren’t important when that same money can make life so much better when it is spent on things that are?